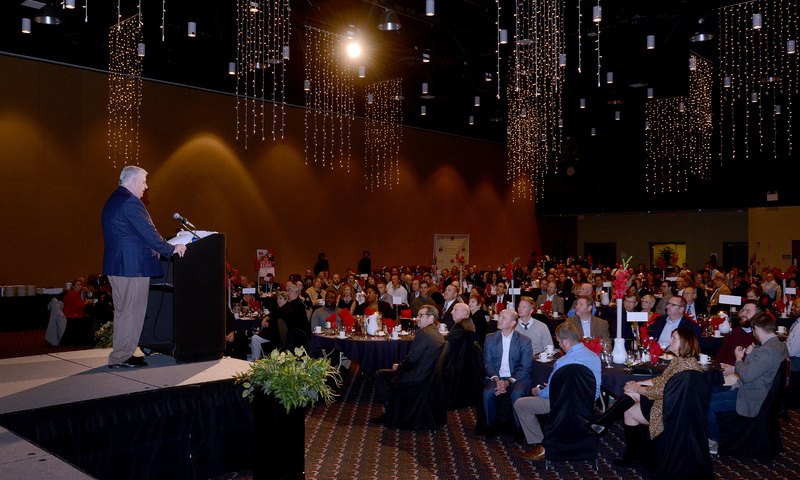 November 18, 2016 – Muncie, IN – Muncie Innovation Connector recently hosted the second annual Excellence in Innovation Awards at the Horizon Convention Center. This celebration recognized leaders in business innovation including those who are well established and others who are emerging. Ted Baker, Executive Director of the Innovation Connector, served as the evening’s emcee. Karl LaPan, President & CEO of the Northeast Indiana Innovation Center in Fort Wayne, was the evening’s keynote speaker. His presentation was entitled, Innovation is a Messy Business. Awards were presented in four categories throughout the evening. Two individuals were recognized for their impact on innovation in East Central Indiana. Nathaniel Spell, a local high school student, was presented with the Young Innovator’s Award for his unique marketing business. Longtime business and community leader, Stefan Anderson received the Excellence in Innovation Mentorship Award for his many years of business leadership and investment in the lives of others. Attendees celebrated five business owners and organizations with the 2016 Excellence in Innovation Award. These businesses have demonstrated the entrepreneurial characteristics necessary to remain solid anchors for the business community in East Central Indiana. In the spirit of innovation, the five finalists of the 2016 BIG Idea Pitch competition delivered their business ideas in live, two-minute pitches to all in attendance. A panel of ten distinguished judges then awarded first through fifth places later in the evening. These five finalists emerged from nearly fifty original ideas during the BIG Idea Pitch. Winners walked away with prize packages totaling nearly $40,000 in cash and services. “Our region has a strong base of entrepreneurial and innovative leadership, and it was certainly on display at the Excellence in Innovation Awards. It was energizing to bring together innovators, both young and old, to celebrate the power of the entrepreneurial spirit,” stated Innovation Connector Executive Director, Ted Baker. The 2016 BIG Idea Pitch and the Excellence in Innovation Awards were presented by the Innovation Connector and sponsored in part by First Merchants Bank and Ball State University. Additional sponsors included The Community Foundation of Muncie & Delaware County, Indiana Michigan Power, MutualBank, Whitinger & Company, Star Bank, Ontario Systems, Whitinger Strategic Services, Ivy Tech Community College, IU Health Ball Memorial Hospital, Bingham Greenbaum Doll, Chick-fil-A, R&R Engineering, Co., WLBC Radio and The Muncie Journal.